Rocket League was the talk of the gaming scene two years ago, and it may be about to enjoy a fresh boost of interest soon. Just in time for the Christmas holiday, developer Psyonix announced the scrappy game about soccer with cars will be coming to the Nintendo Switch on November 14. Nor is it entirely a simple port. 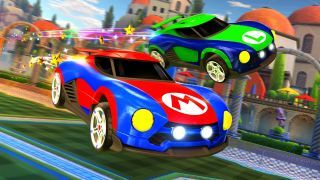 Switch players will get everything that's available on PC, PS4 and Xbox One, but they'll also get perks such as cars with designs that riff off the costumes of Nintendo's iconic Mario and Luigi characters as well as two based off of Metroid's Samus. These cars and other customization options are available for free, but you'll still need to unlock them through in-game challenges. Switch owners will also enjoy cross-platform play with Xbox One and PC players (although, oddly, the PS4 isn't included). Wireless local multiplayer will also be included. Nintendo Minute visited Psynonix's headquarters in San Diego recently, where the team saw the Switch version in action. You can watch the resulting video below. If you plan on getting it for yourself, be sure to check out our tips for winning in Rocket League's duel mode. When it launches, you can download Rocket League from Nintendo's eShop for $20 (about £15 / AU$26).